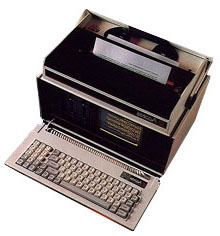 The Access Computer had a 9.5" built-in screen (amber) and a built-in 80 CPS Dot Matrix Printer. It also had a built-in modem and came with a full range of software : CP/M, CBasic, Communication software, Perfect Writer, Speller, Filer and Calc. The name of the machine was shortly changed to Actrix (Access Matrix) because of copyright issues. I sold, maintained, studied, and used this computer. It was unique in that it had a detachable keyboard, TWO 5-1/4" disk drives, an EPSON MX-80 printer built-in to the top, a built-in 300 baud modem, a parallel printer port, a plug-in 8088 IBM-PC card, serial ports, and a full complement of CP/M software including the Perfect Word, DBase, CBasic, and a host of utilities that would make most programmers proud. I ran a FORTH operating system on this machine that ran my observatory for a long time. It was the best portable at the time and still has features that beat "laptops" to this day. Such as input, communication, print apability, transportibility, throw it in the trunk and make it work later capability. I developed the communications utility and various other programs for this computer. I worked for the company about a year as a contract programmer. The computer included everything but the kitchen sink. Unfortunately, the design wasn't very well thought out and it wasn't very reliable. Access Martix was founded by the same individual who manufactured boards for the Osborne transportable. I bought one of these in 1983 and used it for about four years, until I replaced it with an IBM PS/2. Even then I continued to use it as a backup machine. I would have students use it to type in lecture notes, then send them to the IBM via the built-in modem (across the hall). I found it to be pretty stable, and it never broke down on me. But this computer was "portable" only if you needed a weight lifting workout. Mine came with CP/M and lots of Basic software; I programmed statistical routines in basic with this. see more ACCESS Computer ACCESS Computer Ebay auctions !